Pairing chicken with lemon is an ageless tradition practiced by many cultures around the world from Moroccan Tagine Chicken with Preserved Lemons, Italian Chicken Piccatta, Greek Lemon Chicken, and Chinese Lemon Chicken. Doing this classic dish ala Slap Yo Daddy style in a smoker adds a smoky nuance that I think you will like. Smoking the lemons and shallot in the pit before making the sauce will really take this dish over the edge. 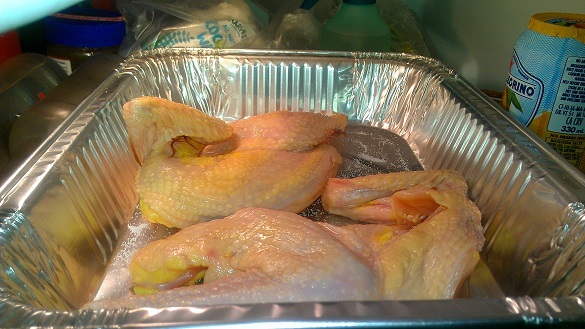 I also dry brine the chicken the night before and leave it uncovered sitting in an aluminum foil pan to dry out so the chicken is moist and the skin is extra crispy. I cook the chicken in the foil pan at 300 and save the chicken drippings to make the sauce. You can also put some diced potatoes to have a starch to complement this dish. 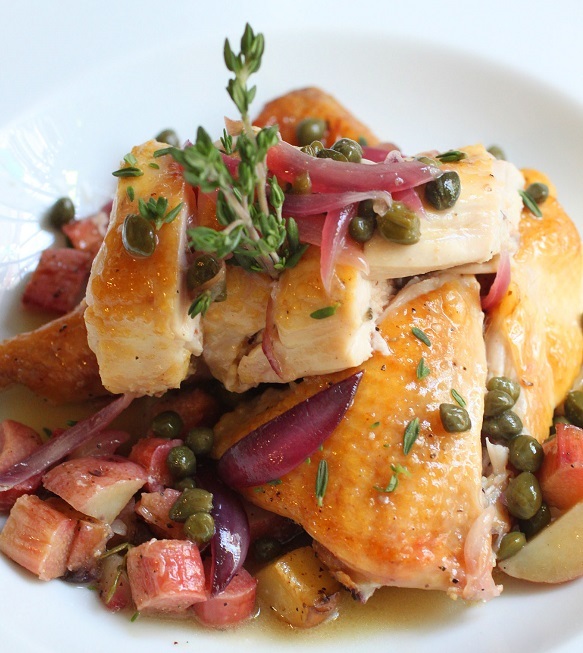 We ensure the sauce is fresh and crisp because we will add the lemon and capers at the last minute. I like to enjoy this dish with some al dente spaghetti pasta with some coarsely ground black pepper, salt, and extra virgin olive oil. 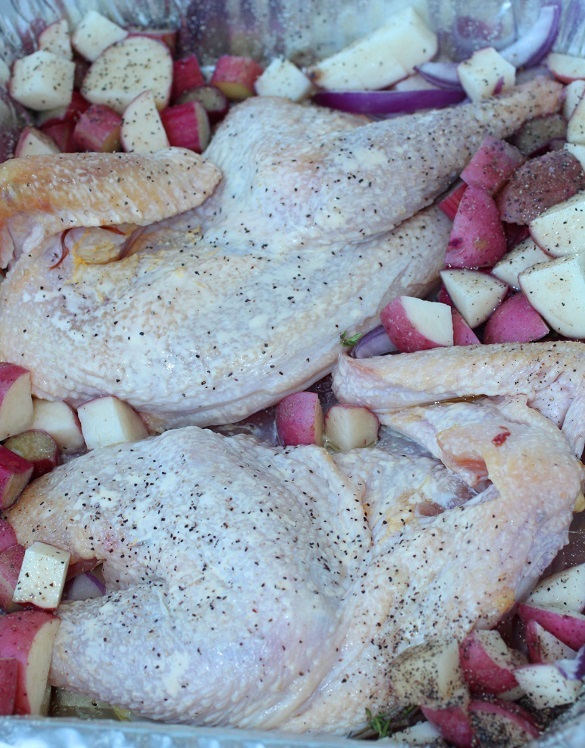 Sprinkle a thin layer of salt onto both sides of the half chicken, about 2 teaspoons per half chicken. Leave overnight in fridge for the dry brine to take effect. Sprinkle some SYD Hot rub on the chicken. Add diced potatoes and put into a 300 degree smoker. Toss in a couple of apple wood chunks to get some smoke. If you like, add some chopped peeled shallots at this time. You can also cut your lemons into half and smoke them while you cook the chicken. This dish can also be done in a oven if you’re not using a smoker. Smoke for about 1 hour or until internal is about 165 degrees in the breast and 170 in the thigh. Remove the chicken with a slotted spoon and keep warm while you finish the sauce. Pour the liquid from the foil pan into a saucepan. If you don’t have enough liquid, use some canned chicken stock to create about 1½ cups of liquid. Add thyme and simmer the liquid until reduced in half. Add a heaping tablespoon of grated Parmesan cheese. Stir with a whisk until the cheese has dissolved. Whisk in 2 tablespoons of cold butter cut in small pieces. Do a bit of butter at a time so the sauce thickens. Just before you serve, add juice from a lemon and the capers. You can use fresh lemons or squeeze the juice from the lemons you smoked. Taste and adjust the amount of lemon to your liking. Some days I like it really lemony and some days I like it mild. Season with salt and pepper. Cut the chicken and arrange on a plate. Add the potatoes and shallots. Pour the sauce over the chicken. Garnish with a sprig of thyme and serve immediately. Cook some pasta to go with the chicken if you like.